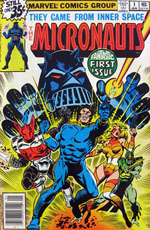 Rhett Reese and Paul Wernick have come aboard Paramount Pictures' big screen adaptation of Micronauts as writers, Deadline reports. First announced for development nearly two years ago, Micronauts will be produced by J.J. Abrams (Star Trek, Super 8) and will be based on the Japanese interchangeable toys, now owned by Hasbro. First released in Japan in 1974 as Microman, the toys were imported to the U.S. by the Mego Corporation two years later. The mythology was then expanded in a Marvel Comics series, beginning in 1979. Subsequent takes on the property were offered in comic book form by Image Comics and Devil's Due Publishing with each iteration offering very different takes on the toy universe. There is not yet word on whether any of those specific takes will influence the feature film version. Reese and Wernick are best known for writing Zombieland and worked on a different Hasbro Toy property for Paramount with the upcoming G.I. Joe sequel.